The manifestation of God, Parama Gurus Sri Sri Sri Bhoga Siddar, Sri Sri Sri Mahavatar Babaji and Pujyasri Aathmanandamayi Maathaji wishing the entire world Eternal Peace and Happiness, gifted the unique form of Sushumna Kriya Yoga. The Gurus revealed that, through the regular practice of Sushumna Kriya Yoga one can attain (Moksha) enlightment and eternal bliss irrespective of ones life style. Before proceeding further please select the suitable "time length" for meditation according to the each age group in the table given below. Sit in a straight and comfortable position. Keep your hands in Yoga Mudra. Chant 'AUM' for 21 times. listen to sample audio clip. Take 'Long breaths' for 14 times (with a good feel). Gently focus between the eye brows(third eye) to attain thoughtless state. Sit in a very comfortable position(on a chair, sofa, bed or floor) with eyes closed for the next 7/14/21/49 minutes with the back/spine and neck in straight line/erect position in a relaxed manner. Apply Yoga mudra as shown in the figure and keep the yoga mudra on your lap or on your thighs wherever it is comfortable. The ideal posture is displyed in this photograph for the benifits of viewers. Start chanting AUM softly and rhythmically as demonstrated in the audio clip. The chanting of “AU” syllable is less and “UM” syllable is more. Make sure that the AUM sound vibrations starts from Navel position(Manipuraka chakra) and travels upwards to the Head region(the Ajana and Crown chakras). At the same time, Listen to your own chanting and enjoy the vibrations. Stop chanting AUM after 21 times. Breath in very slowly and fully and Breath out slowly and completely. While breathing in feel the positive/virtuous things entering the body i.e. health, peace, happiness, success, love and while breathing out feel the negative things going out i.e. stress, diseases, anger, disturbances, depression etc. Stop deep long breaths after 14 times. Now gently bring your focus on to the third eye region (the Ajana chakra), the point between the eye brows. While doing so, do not apply any sort of pressure on the forehead as this might cause headache. Observe/Focus on the forehead region very pleasantly. Do not chant any Mantra mentally/outwardly or Visualize any form of GODS/MASTERS during this 7/14/21/49 minutes of meditation session. First 49 days is very crucial and important as it will establish the channelling/contact to & with the Gurus/Masters. This meditation should be practiced through out life . 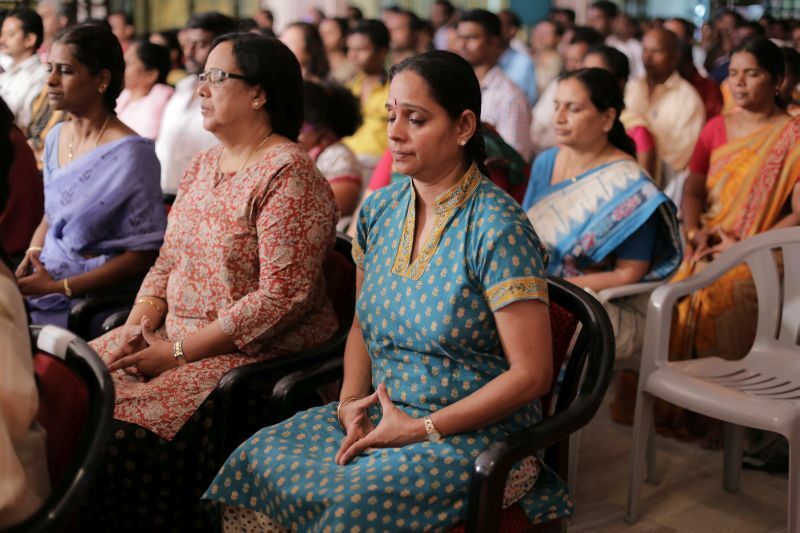 Do not open the eyes OR break yoga mudra till the end of the stipulated meditation session. Set an alram for 7/14/21/49 minutes before starting session. 7/14/21/49 minutes includes Chanting of ‘AUM’,Deep Long Breaths and Focus at the Third Eye Region. Chanting of ‘AUM’, deep long breaths and focus at third eye region will help you to cut down your thoughts and help in attaining a thoughtless state. Release the Yoga Mudra after 7/14/21/49 minutes session, bring both the palms to touch eyes/face and be there for a while (5 seconds) then look into the palms with half opened eyes and gradually come out completely with a gentle & pleasant smile.